In this step by step tutorial, I’m going to demonstrate how to build a rustic faux beam mantel. I will show how I distressed the wood to give it an aged reclaimed look for a fraction of the cost of a real reclaimed beam. Hey Guys! So recently I was approached by a neighbor for assistance with a project in her home. She and her husband had removed the old mantel from their fireplace in the living room because it was damaged. After removing the old mantel they both realized that they hated their existing fireplace. They didn’t know exactly how to refinish it or what direction they wanted to go. So we talked about various ways in which they could make some changes without breaking the bank. My neighbor loved the idea of painting the old brick white and adding a rustic wood beam mantel. She also had never really used power tools. So we worked together and this is what we came up with. She provided me with a list of things that she envisioned for her fireplace, in which I took and created a floating mantel that looks like it’s an old vintage beam that you’d find in some old farmhouse or barn. She and I then installed it together. Here’s what we did. Step 1. Cut the wood to size. In order to achieve the illusion of a single beam or solid piece of wood, it’s important that the cuts for 3 of the sides of each piece be made at a 45-degree angle along the entire length of the wood pieces. The back of the mantel is flat and open. So the back will have a straight edge. You can make these cuts using a circular saw. Step 2. Glue and Assemble the Beam. Using wood glue and a brad nailer attach the front board to the top. This part may require a second pair of hands or really good clamps as you get everything in place. With the top board and front of the beam attached it’s time to add the side. 3 sides are cut at an angle while the part that faces the wall is flat. I used my Kreg multi-purpose layout tool to ensure that all of the sides were square. Step 3. Age and distress the wood beam. I then beat the mantle with a hammer and literally any sharp object I could find in my garage. Step 4. Sand down the mantel. I started with my oscillating sander and then I moved to my belt sanders so that I could create dents in the corners and on the edges in an effort to create more detail and depth. I went over everything with a coarse sandpaper, then a medium grit sandpaper. I sand it all down until it was smooth and wiped out any excess dust. Step 5. Assess the distressed markings. If satisfied, move on to the next step. If more distressing is necessary, repeat steps 3 and 4. I then stepped back and reviewed everything. I thought the mantel could use some more character. So using my Dremel and the sanding tip I carved into the edges and into the front of the pieces of wood. I even used a chisel to get in some nicks and scratches. To be honest, you could really do this all day. So it is up to you when to know enough is enough. Once I felt like ththat’s enough I sanded the mantel down once again down to a finer finish, starting with 80 grit coarse sandpaper, the 100, then 150 and finally a 220 grit sandpaper. For the sandpaper, I used SandNet Disc by Diablo . This sandpaper is great because it lasts so long. You can literally use them and shake it off or even rinse it off and reuse it. Also, it takes off a tremendous amount of wood. Then I wiped dow the boards with a damp cloth. Step 6: Stain and apply paint treatment. Once I’d gotten the mantel to a desired distressed look I stained it using wood dye. For the corners and creveces I applied an acrylisc paint treatment, blending various shades of brown. Hahaha I loved using the scrap wood as my artist palette. I then sanded down spots with a fine 220 sandpaper before reapplying the 2nd coat of wood dye. I loved the way the stain/dye took to the boards. Step 7. Mark the location of the corbels and cut the board for the bottom of the mantel beam. Mark 10 inches from each side. This is where the faux brick corbels would be placed. Using scrap wood plywood I cut out the board for the bottom of the mantel beam. This board will not be seen. All of the sides are cut in straight edges. Then I drilled the pocket holes. Step 8. Create the faux brick corbels. Using 2×4 wood pieces cut the pieces needed to create the faux brick corbels. 2 sets at 7in., 5in., 3in., & 2.5in. Attach using wood glue. So when I created the first corbel I attached using glue and clamped it all together. But when I got around to the second corbel, I realized I was going about this all wrong. I can quickly assemble the corbels with the help of my brad nailer. So using wood glue and the brad nailer to hold the pieces in place I assembled the 2nd corbel. You can do this either way. If you have a brad nailer you can attach this way of just use clamps and wood glue. With wood glue you do have to wait 24 hours for it to dry. Step 9. Attach the corbels to the bottom board. Attach the corbels to the bottom board before attaching it to the mantel. This makes the addition of the corbels so much easier. Each corbel should be placed on the pre-marked line on the board so that it is 10 inches from each side. Using Spax screws I attached the corbels to the bottom board. Step 10. Attach the bottom board to the mantel. Finally with the corbels attached I attached the bottom of the mantel using pocket screws. Step 11. Create the support beam for the floating shelf mantel. The shelf support is simply 2×4 cut down to fit the length of the mantel so that the mantel can rest on it. Step 12. Install the Mantel. With the mantel fully constructed it was time to install this baby! We started by pre-drilling the screw holes for the shelf support. We used the Bosch Daredevil Multipurpose drill pits for this because they are absolutely amazing. These drill bits drill through wood and brick with such ease. With the holes predrilled we started the screw through the board on the floor. I highly recommend prestarting the screws. It makes the process easier. We then matched the screws up with the predrilled holes in the brick and finished screwing each screw in place. It was so easy. I recommend using a screw like Tapcon ancors when working with a brick fireplace. It provides a little more support. Make sure the shelf support is level before attaching the mantel to the support. Lastlly using some Spax screws we drilled the mantel to the back of the support beam. WOW! What a world of a difference. My neighbor’s family room looks like a totally different space. I have to say that I love how the mantel turned out. It totally changed the look and feel of the room. It made me want to go back and create some faux rustic beam floating shelves for my house. The pieces of wood used to create this mantel actually look like a solid piece of wood. It has a reclaimed vintage feel. We transformed a dated fireplace with simply a little paint and rough lumber that you can easily find at your home improvement store. The estimated total for the paint and materials used for this transformation: $50-60. Not bad at all. Thank you so much for your plans! Just spent 3 days putting together a mantle based off your plans. Keep up the awesome projects! Hey Josh! Thank you so much. I am so glad you found this post helpful. I know your mantle looks awesome! 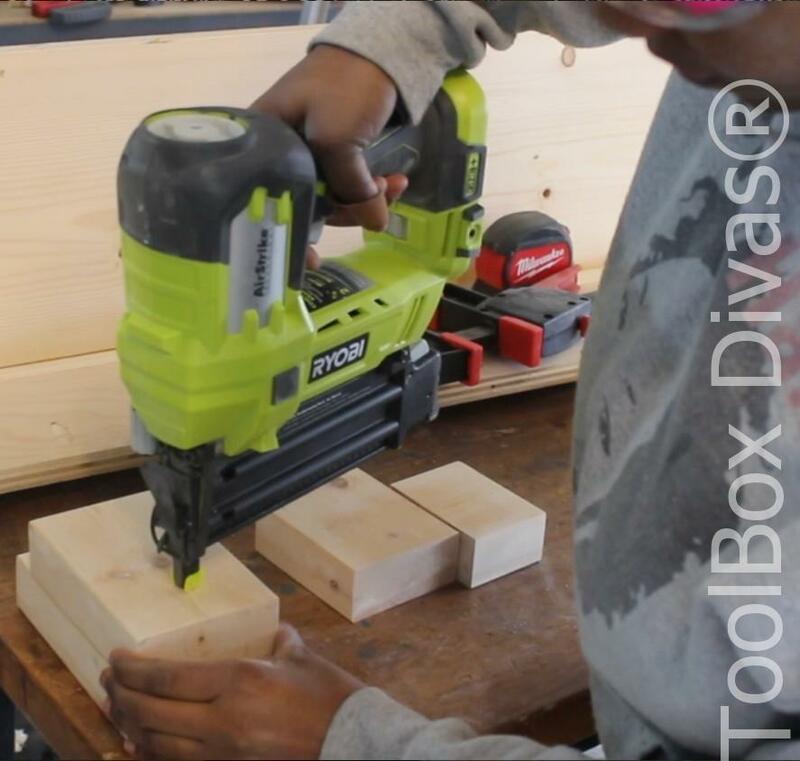 A best and wonderful DIY project with wood and hammer drill. Such kinds of information I search a lot of blog. Truly said that I got an excellent article from you. I feel comfort for reading your post. Your post is valuable and comfortable and good advice for beginners. Wow thank you so much Danny! That means the world to me. Thank you so much! I really appreciate it.